‘Oh no!’ my wheelchair suddenly won’t shut and we find the cross-brace has shorn in two at the weakest point. I am more disabled than ever before in the tank I get loaned as a temporary replacement. I have literally gone from the Ferrari of wheelchairs to the oldest crock on the road in one terrible moment of loss. And so it is…back on the phone to nag, beg and plead for a speedy repair. The year continued thus. Next was a back injury. Soon over, but frustration nonetheless. Creatively, I haven’t had quite so much resource to put in this direction. And when that is so, I like to return to something I know will go smoothly. I haven’t made a knit / felt bag for a while and this pattern is one I love. Ravelry followers will find it under the name Making Waves but I have redesigned the handles. It is a delight to knit and this time I indulge in the most beautiful wool. This IS the Ferrari of chunky wools; <strong>Mirasol</strong>&nbsp;<strong>Sulka</strong> in the deepest, dark chocolate shade of&nbsp;<strong>cacao</strong>. It has twinkling lights in plum and pink brought out in the shine of the silk content. 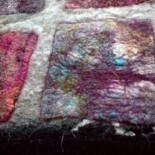 It isn’t really intended as a felting wool. Strictly speaking it is too good for that I wanted the sheen to really bring out the texture of the cables which snake up the front of this design. One small worry was that the yarn fuzzes a little bit with friction so I wondered if it would fluff quite a lot when felted in the washer. I’ll just have to see. Knit / felt items always have an element of the unknown about them. You just have to throw them into the washer and hope. Before Easter we went off to the Lakes to one of our favourite holiday places. This view is over Esthwaite valley. This Lake, made famous by Beatrix Potter in Jeremy Fisher is a gentle environment compared to some of Cumbria’s lakes. We were extremely ucky with the weather and I spent some time knitting in the sun on the veranda of this lovely holiday location which we have been visiting for years. And some time out and about. These pictures were taken at John Ruskin’s house Brantwood, Coniston. Much restored I know all my enterprise has got me somewhere better. And this came out of the washer, perfectly evenly felted and no fluff. Sometimes it seems endless, doesn’t it? This entry was posted on 06/05/2014 by Themidlandperfumer in bags, craft, crafts and crafting, creative process, felt, felting, knitting, textiles and tagged bags, knit, knit felt, knit to felt, Knitting, Lake District, lakes, Mirasol, Sulka, yarn.